About Car vacuum: Integrity and quality are our gene. We adhere to treat product quality as our life. Products keep up with the latest technology and customers' request. Note: 1.Please turn on the ignition of your car to provide sufficient power while using this car vacuum cleaner. 2.It will be more powerful if start the car first while use the car vacuum and the filter should be cleaned up every time of use. 3. Do not touch the metal cigarette lighter after use the car vacuum. 4. Please use the car vacuum for no more than 20 minutes at a time. 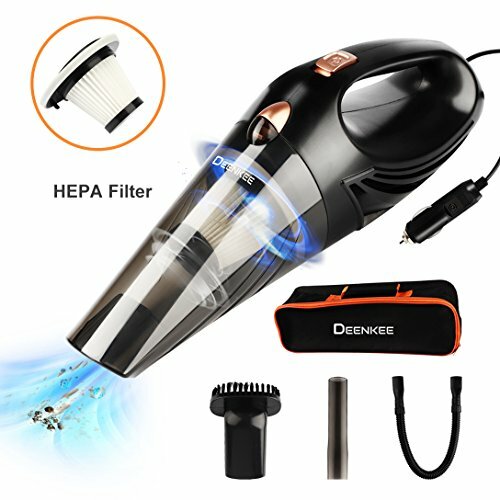 Specification: Model:DK01 Voltage: DC12V Max Power: 106W Input-current: 8A Noise decibel: ≤75DB Max vacuum degree: 3,500 Pa-4,500 Pa Material: ABS & PC Cable length: 16.4ft/5m Weight: 23.00oz/653g Size: 13.78 x 4.33 x 4.33 inch Package Includes: 1 x Handheld Car Vacuum 1 x Extension Hose 1 x Brush Attachment 1 x Crevice Attachment 1 x 16.4ft/5m power cord 1 x HEPA 1 x Storage Bag.